Prince of Peace Parish was founded on November 1, 1992, as a vivid and real response to the challenge of change on the South Side. Our Catholic roots run long and deep in the fertile grounds tilled by those who have gone before us. We are called to foster those precious seeds in the spirit of FAITH, HOPE, and LOVE. St. Adalbert - 160 S. 15th St.
St. Peter - 28th & Sarah St.
Saturday: 3:00 p.m. - 3:45 p.m.
Wednesday: 6:00 p.m. - 6:45 p.m.
Or by appointment at both. Announcements/Updates - Watch here for special announcements, delays, cancellations, etc. Please click on the link below to see the schedule for Holy Week and Easter Sunday. I am going to another Church for the first time.... where do I park? Saint Adalbert Church - Parking is available in the parking lot on 14th Street across from the back of the Church. Space is limited so get there early. There is also parking at the Parish Center located at 81 S. 13th Street. Located a few blocks from the Church. Short walking distance. Street parking where available. 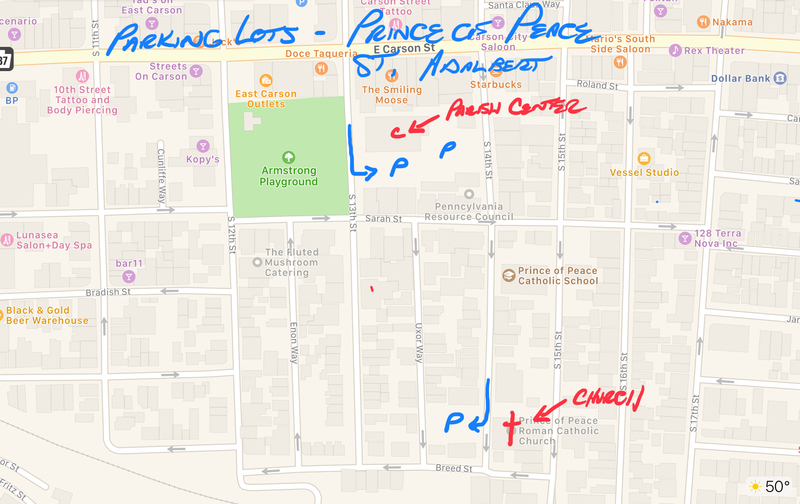 Click on the link below for a map of Saint Adalbert Church parking. Saint Peter Church - There is parking behind the Church (entrance from 28th Street). There are several parking lots and garages across East Carson Street in the South Side Works, within walking distance of the Church. Fees will be at the evening as opposed to the day (work week) rate. Street parking where available. 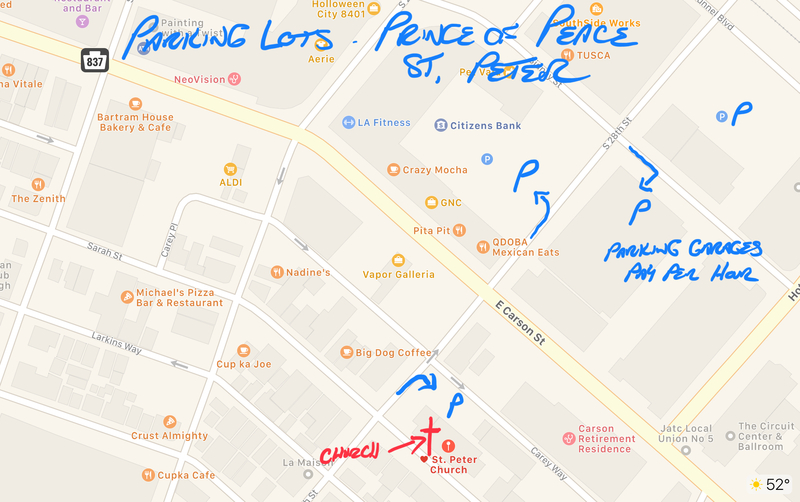 Click on the link below for a map of Saint Peter Church parking. Saint Mary of the Mount Church - Parking is available in the lot adjacent to the Church (entrance from Grandview Ave.). Space is limited. There is also parking available in the vacant lot across the street from the Church parking lot (entrance from Bertha St.). Street parking where available. 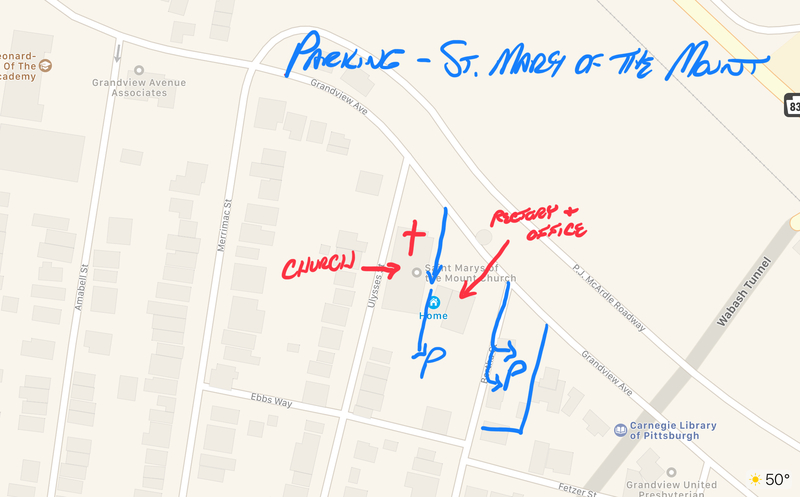 Click on the link below for a map of Saint Mary of the Mount parking. Fish Fry's are held every Friday during Lent from 4:30—7:30 p.m. in Sullivan Hall Cafeteria, 131 Bigham St., 15211. For everything concerning the Mt. Washington Fish Fry contact: patty.campbell5357@gmail.com, or 412-841-4089. There will also be Fish Fry's held on Good Friday at Sullivan Hall. 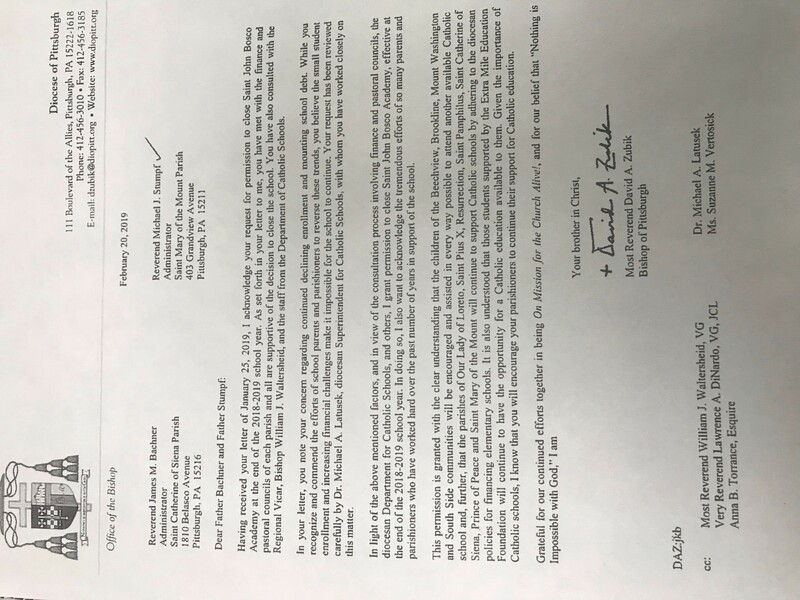 In light of declining enrollment and mounting school debt, Bishop David A. Zubik has granted permission to close Saint John Bosco Academy. Click on the link below to read his letter concerning Saint John Bosco Academy. 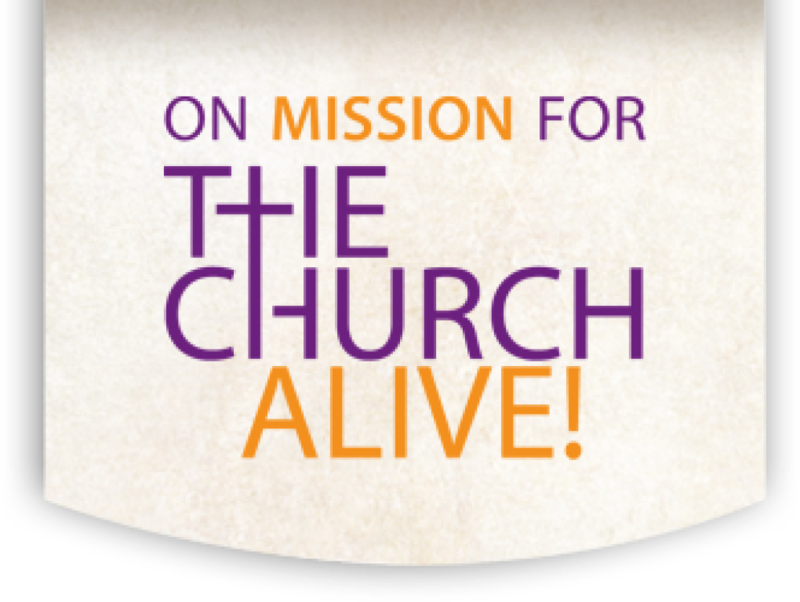 Please know that 100% of every gift goes to the mission. The Diocese of Pittsburgh does not retain any of the funds. If you want to learn more about our mission trips, information is available on the website, on the Get Involved page. For specific dates or other details, you can call the diocese at 412-456-3085 or email us. Thank you for your generosity. In compliance with Diocesan policy, the Parish Finance Council brings you this year end report, that includes July 1, 2017 - June 30, 2018, actuals, as well as the proposed budget for July 1, 2018 - June 30, 2019. Click on the link below to see the Annual Financial Report. Click on the links below to see Biographical Sketches of the Clergy Team, and informational statistics for both Prince of Peace & St. Mary of the Mount Parishes. Flocknote is a new way of receiving information about our parishes by way of text or email! For more information and how to sign up click on the link below.